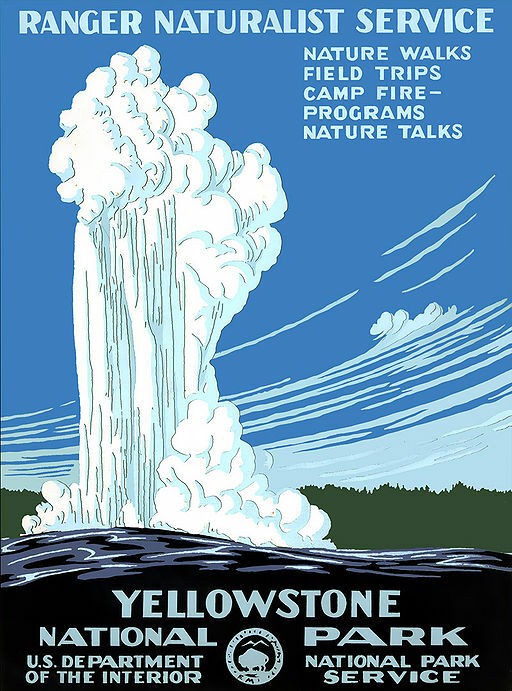 A few weeks ago I posted some concise talking points about Yellowstone so you could sound smart at your holiday gatherings, and I promised a continuing path to geekdom. Join the journey today, as I expand on point number one. Yellowstone is hot like a romance hero. Well, duh, everybody knows that. It’s gorgeous, steamy, and explosive. Not all of the chamber is full of melted rock. Some areas are probably solid or semi-solid. The point is there’s a minimum of something like 12,800 cubic kilometers (8,000 cubic miles) of freakin’ hot rock sitting down there. It heats everything above it, including creating super-heated water, hence the geysers, bubbly mud pools, and hot springs. Occasionally this gentle release of heat isn’t enough and it erupts, usually in a small way and other times like a Roman candle. As in one-thousand times the Mt. St. Helens eruption. 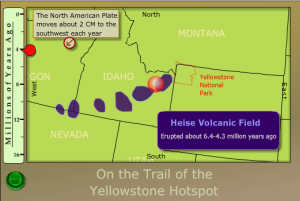 That epically large potential is why Yellowstone is known as a super volcano. (Call it a super caldera if you want to be really geeky and correct, which you do.) We’ll get into the “super” part more next time, but a caldera is an area of volcanic activity that sinks to fill the void left when a volume of magma exits. While we picture most volcanos as cones sticking up, a caldera is a saucer dipping down. If they were belly buttons, calderas would be innies. 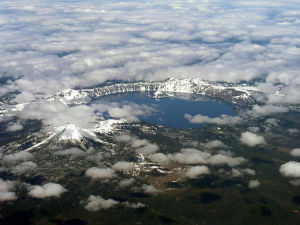 They make beautiful lakes, such as the aptly named Crater Lake. 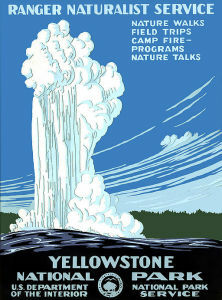 The long history of the Yellowstone hot spot illustrates plate tectonics, the movement of large crustal pieces of earth over top of the earth’s mantle, which is a pliable layer between the solid core and the crust we all know and love. This National Park Service web page shows 16.5 million years of migration of the North American plate over the hot spot, which is pretty cool. I mean hot. Check it out yourself to see some of the known major eruptions. If you have any questions about what I’ve written so far, ask away. I’ll do my best to answer or let you know if there is a future post that will address it. Next step on the path to geekdom? The geographical size and eruption history of the Yellowstone caldera.